Frugal and Thankful: Food waste and a menu, week 7/28-8/3. Food waste and a menu, week 7/28-8/3. And what's gonna be on your table this week? It's 59 here and freezing. Please send me some of your hot weather. Things have been so crazy here that I'm kind of making up dinners as we go. DJ is leaving for college on the 13th and then I will have no more little ones at home. I think that I am going to miss him. Shhhh, don't tell him. Oh sweet lord, what is in that delicious looking picture? It looks amazing & I too now want some. :-) We're having tacos, paella, pasta + chicken, & maybe quesadillas this week. It's a pumpkin roll :) Your menu sounds delicious!! That looks yum! What is it? Honestly, it seems like summer just arrived a couple of weeks ago. I have a hard and fast rule that everything (project-wise) needs to be completed before Halloween. It seems now that Halloween is the beginning of the rush toward the holiday season. This year I am actually aiming for October 1. We used to make fun of my mom for having this arbitrary October 1 date for having things done. By golly, she was right___again! We have had a cool summer here. In fact, we had to leave the park yesterday because we didn't have jackets and it was chilly. Crazy! I've never heard of such a thing here. I don't like it. Your dish looks good. What is it? 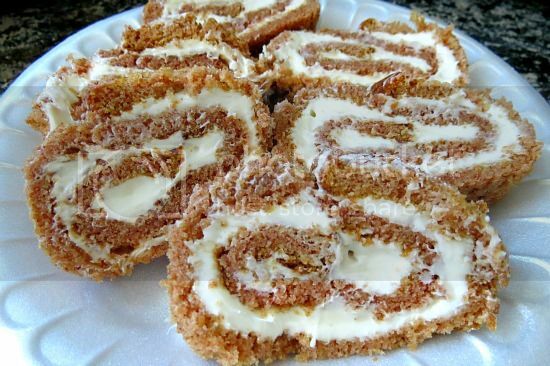 Pumpkin roll! You had to put the picture up didn't you? Thanks a lot, now I want to eat one and I am not eating for 3.